Please watch this page for information about the upcoming conference, including competitions, proposals, performers, guests, and the conference schedule. Click here for more information about the High School Solo, Quartet, and Collegiate Solo Competitions. The schedule for NASA 2018 Biennial Conference promises a rich variety of what our instrument has to offer. Click here for the conference schedule / list of presenters. Thank you for your interest in attending NASA 2018 Biennial Conference. Online registration is now closed. Onsite registration will be in the Conservatory of Music, starting Thursday, March 8, 3:00 - 7:00 PM, then 9:00 AM - 5:00 PM Friday and Saturday. Your NASA membership must be current in order to attend the conference. If you are not a member of NASA, you must join NASA first in order to register and attend. You can also renew your membership onsite when you register. If you have any questions about joining or NASA 2018 Biennial Conference, please contact the NASA Membership Director Joshua Thomas by or 860-912-0565. Conference registration includes access to all conference concerts, master classes, lectures, etc., on a first-come, first-served, basis. We will be checking badges, and we don't want anyone to get upset for being turned away from a performance because they don't have a badge; thus, we have asked that all collaborative musicians (that wish to attend any performances) register for the conference. Please note that collaborative musicians must be registered by the NASA member whom they are collaborating with. The NASA member should list all collaborators when registering themselves. This will generate name badges for those collaborators. It is completely free (up until March 1). If the collaborative musician isn't going to attend any concerts, then they don't need to be registered. The same applies to non-saxophonist composers and non-saxophonist spouses. Registration is free (until March 1), and required if they wish to attend any performances. Saxophonist spouses and composers, if they are performing, must join NASA as either professional or student members, and also register for the conference. Cancellations after Thursday, February 22, 2018 will not be eligible to receive any refund. Day Passes can be purchased at the NASA registration table in the Conservatory of Music. Day Passes do not include program booklet. Evening Concerts Only tickets to be purchased directly from the ticket office. Limited availability. Registrants will be seated on a first-come, first-served basis for the Thursday night concert. 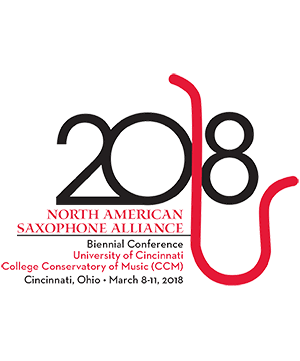 The North American Saxophone Alliance 2018 Biennial Conference would not be possible with out the generous support of our sponsors, exhibitors, and advertisers. With nearly 1,000 saxophonist expected to attend this four-day event, it is a great opportunity for vendors to showcase their products to amateur and professional saxophonists from around North America. A limited number of Premium Sponsors will be available during the NASA 2018 Biennial Conference. These sponsors will help support the prizes of the five competitions that are run during the conference and are a great way to support students' educational and performance achievements. Please see our information on exhibitors and advertising for the NASA 2018 Biennial Conference.